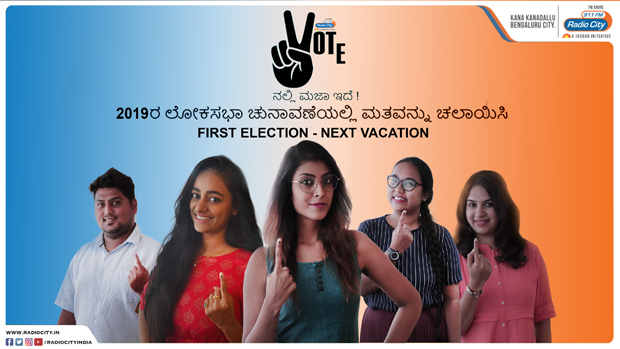 Bengaluru : At the onset of Lok Sabha elections 2019, Radio City, India’s leading radio network, announced a voting awareness campaign, ‘Votenalli Maja Ide’, with the objective of increasing voter turnout in Bengaluru. The campaign aims to help the BBMP (Bruhat Bengaluru Mahanagara Palike), enhance voter participation in Bengaluru which otherwise usually sees the lowest voter turnout amongst other metros. Radio City Bengaluru’s RJ Rajas and RJ Sonu, have been appointed as BBMP’s brand ambassadors and are the only RJs from Kannada’s radio stations in Bengaluru to be nominated as the district icons. As the face of BBMP, the RJs aim to amplify the need to vote, by visiting colleges and attending meetings. The jocks have also been a part of the election literacy club inauguration at various colleges. As part of the on-air plan, Radio City Bengaluru highlighted the election toll free number 1950 and aired radio dramas on importance of elections, apart from sharing crucial information about the voting process and the facilities made available for the physically challenged citizens. The Chief Electoral Commissioner, Karnataka, Mr. Sanjeev Kumar shared with the listeners the significance of EVM, VVPAT and Cvigil app, amongst other information. The on-ground activation of the campaign included flash mobs at various locations across the city. The campaign that translates into ‘Voting is fun!’ witness Radio City RJs in Bengaluru, urging listeners to prioritise voting over their vacation plans to establish the importance of exercising their voting rights and will gratify some listeners with a holiday package. As a part of this drive, Radio City has created an election song which was sung by popular playback singer Abhinandan Mahishale. To check out the election song by Radio City Bengaluru, click here. Radio City, a part of Music Broadcast Limited (MBL) is a subsidiary of Jagran Prakashan Ltd. Radio City was the first FM radio broadcaster in India and brings with it over 17 years of expertise in the radio industry. Amongst the private radio stations, Radio City has consistently been the number one radio station in Bengaluru and Mumbai with 24.17% and 17.10% average listenership share respectively. (Source: TAM Data – Radio Audio Measurement, Markets: Mumbai and Bangalore TG: 12+ Day-part: Mon-Sun 12:00 AM-12:00 AM, Place: All; Period: from December 30, 2012 to January 21, 2017) and as on March 31, 2017, Radio City reached out to over 67 million listeners in 34 cities covered by AZ Research (Source: AZ Research Report).